My pregnancy nausea prevented us from hosting a babyq (bbq for the baby...get it? Very popular atm). We did begin the planning of a special day. The Builder saw sense pointing out that it would not be overly joyful if I'm laying on the couch for most of the party or randomly vomiting because someone smelt weird. This happened more than I like to remember. Had we ended up hosting our baby shindig, we would have kept it zero waste by choosing food in bulk, making things from scratch where needed or purchasing in our usual reusable containers, borrow decorations, use real plates and glasses, no plastic straws and compost our food scraps. It would not have been too different from any other event we had hosted. Cooked food that can be heated up in a pinch is a new parents ultimate gift. It's so important a breastfeeding woman eats and not skip meals. They are required to up their calorie intake even more than pregnancy. A fun gift would be to put together a menu option or food tickets so the parents can call them in. 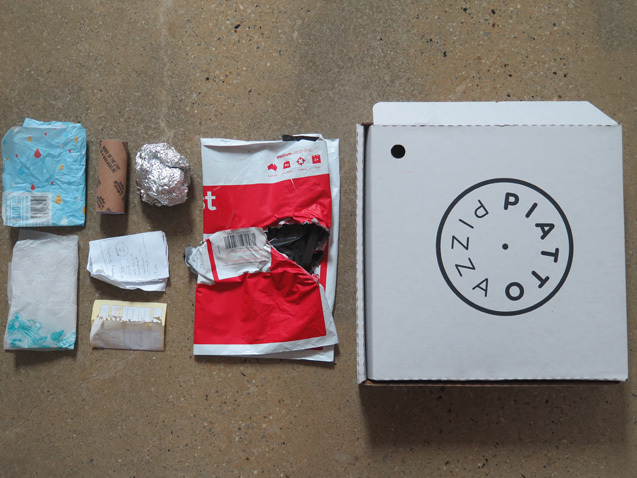 Like an UberEats, but by family and friends. Think simple dishes full of roasted root vegetables, slow cooked meals, soups, rice, fruit and desserts. I'd advise against anything that could cause colic (gas) if mum is breastfeeding. For inspiration, look up anti-colic diets. Food can be divided up in glass jars as individual meals, ready for the freezer. If you know parents that are doing reusable nappies, also known as MCN's (modern cloth nappies), this gift would be AMAZING. Dirty nappies are picked up, washed, dried and dropped back to the tired parents. This is the kind of gift that could woo parents into trying cloth nappies too. Many of the services offer gift vouchers. If this is a gift that you think would be a hit (I can guarantee it would! ), do double check what detergent the nappies are washed in. Us eco mama's don't want anything too harsh that will end up close to our baby's bottoms. If they are using cloth nappies, chances are cloth wipes will be on the agenda too. 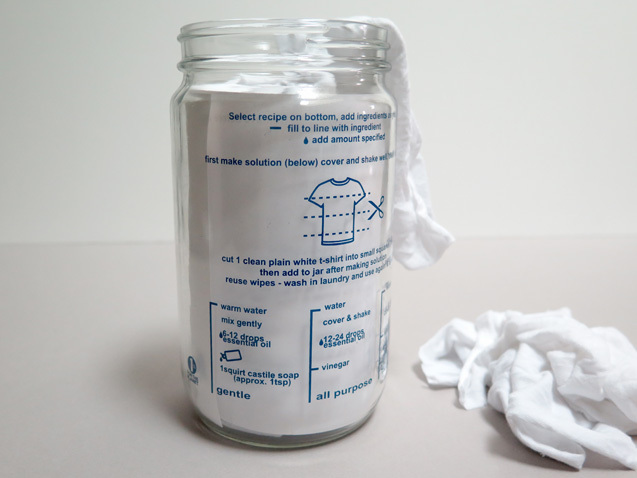 Cleaning Essentials have put together a glass jar for making zero waste, safe and effective eco-conscious DIY reusable wipes. I love that the instructions are on the jar, meaning there is no risk of ever losing them. The jar has three sets of instructions ranging from gentle, all purpose and heavy duty. Once the jar is not needed to make the baby wipes (gentle), it can be transformed for use in the home (all purpose or heavy duty). It's easy and compact, making the jar ideal for parents to take out of the house with them. The gift of toilet paper? Am I that sleep deprived to make a crazy statement? Maybe, but hear me out. Toilet paper is right up there with food as an essential item for new parents. The focus for the first year is on a new tiny human, not keeping the toilet holder stocked. Day to day chores like buying toilet paper is going to be far down the list of things to remember. And if a parent can save some extra time not shopping for an essential item like toilet paper, that is a gift in itself. Now i'm not suggesting you run off to the supermarket to buy a trolley full of loo rolls. There is a far smarter and discreet option called toilet paper delivery. Who Gives A Crap sell a box of 48 rolls for $48 made of either recycled paper (post-consumer waste, like texts books) or bamboo (tree free!). Each rolls is individually wrapped in fun, reusable paper (a law requirement they are individually wrapped). 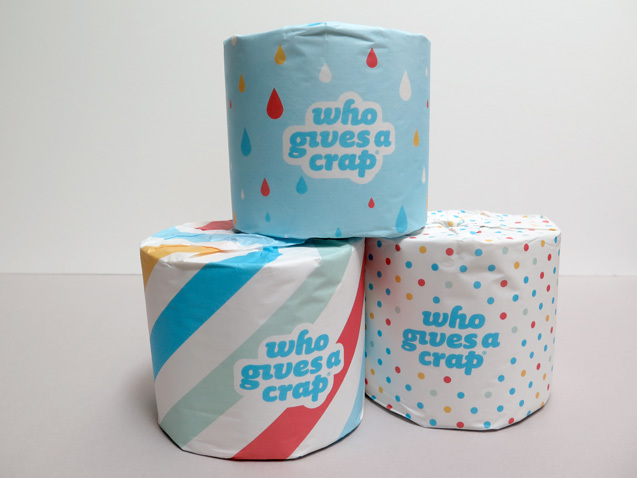 50% of all profits are donated to Wateraid to build toilets and improve sanitation in developing countries. Who Gives a Crap are one of only a small handful of companies (another one is Pure Planet) that sell toilet paper plastic-free. Those paper wrapped toilet rolls by Safe found at the supermarket has a thin layer of plastic. Gift vouchers are also available. Use this link to receive $10 off your first order. If the parents have committed to cloth nappies, they will be rinsing and washing often, potentially resulting in dry hands. I love to take five minutes once bub has goes down for his evening sleep, to rub a decadent smelling moisturiser over my hands to keep them soft. It's a nice ritual and helps me relax. Etsy offers beautiful ready made options, like this lemon myrtle cream. Get more personal by creating a DIY blend using ingredients from Biome. In each Biome store, or via their online store, you can buy the ingredients in handy reusable glass jars. If you are lucky to live close to their Balmoral store, all ingredients can be picked up in bulk from the naked beauty bar. All of Biome's products are 100% palm oil free too. I have yet to meet a mum that does not have a crick in their neck and ache on the body either left over from pregnancy or bending over and picking up baby all day. While those babies start off small in weight, they grow quickly and pretty soon you're carrying around 8kg. Taking a break for an hour to relieve the aches and pains will not only be good for the body but also for the mind. I didn't think we'd be taking as many photos as we have been. I plan to be in the moment but then part of me wants to record everything because they grow so quickly. Sometimes I wonder if we even took enough photos in the first week! Lucky, second hand stores have plenty of photo frames to put the memories into. Offering services like cleaning dishes, vacuuming, going for a walk with the new parents or just visiting to watch baby while either mum or dad can have a shower, meal or nap is a thoughtful gift. The parents will also appreciate the chance to have an adult conversation. I know it helps me. Pick up a secondhand basket from the local charity store and begin filling up with items from the list above. Before leaving the charity store choose some children's books and clothes that the new parents might like too. You could even tuck a list of baby friendly cafes in their neighbourhood into the hamper. Baby friendly = space for prams and comfortable seating to feed in (ie, seats with a back on them). Cafes won't actually turn a parent away! Don't forget to add in some hankies for the new parents too. You can read why I think they are a wonderful zero waste gift to pass along here. To prepare for our role as parents, we decided to attend the hospital's parenting class. Before the lesson began our facilitator asked if anyone had experience looking after small children, infants or babies. Neither of us could raise our hands. My experience with babies prior to the birth of my son was limited. Time spent with the offspring of family and friends mainly consisted of cuddles, usually under supervision of mum and dad. I knew next to nothing about what a baby needs. To say I felt unprepared going into parenthood would be a gross understatement. Turns out parenting didn't solely consist of changing nappies, washing clothes and cuddles...there was this whole development thing, making choices that will shape his whole life. And it starts from the beginning. Within minutes of leaving the parenting class, we begun asking each other questions on how are we going to respond to certain scenarios when they arise. One particular area we circled back to a few times was our lifestyle; how would we deal with this as parents? How can we get prepared? Will living zero waste turn him into a barry no friends at school? What will other parents think of us? I decided to dedicate a blog post on the subject of raising waste wise children. I need a year of being a parent before I'll feel close to confident writing on the subject myself. So I invited three mothers living zero waste, Lauren, Tammy and Meredith, to share how they do it and pass on advice. 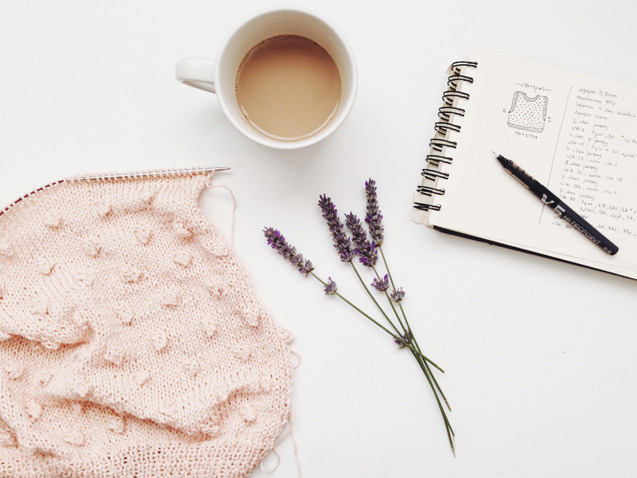 Grab a biscuit and a cup of tea, it's a good long post packed with sageness. Lauren - Hobart, Australia. Mum to three; primary school and high school age. Our children have been totally on board from the very start of our move towards zero waste living. We’ve always been honest with them about the state of our environment, and human impact on it, but we balance this with a good dose of nature appreciation. We feel that encouraging a love of the natural environment can result in a passion for protecting it, and so far this has worked well. They’ve gone on to become advocates in their own right, approaching businesses and community groups to ask them to reduce their waste output, and engaging their peers and family members in discussions around waste and environmental concepts. They’re informed and, for them, zero waste living has become normalised. A key for us in finding a good balance for our family is discussing issues in partnership and giving our children the space to voice their opinions, and make their own decisions. We take them shopping with us and involve them in the process. We encourage them to explore and find out more about things are produced and transported, to ask questions and learn more before making a decision. This means our children are responsible for the choices they make, rather than feeling like we won’t allow them to do or have something they want. We also encourage them to find other ways to make, replace or acquire the things they want. They’re amazing second hand shoppers! And they make their own toys, or we find compostable versions of the things they really want. We’ve learnt alongside them much of the time, and engaged them in processes around the home, like composting, animal care, cooking and preserving. Our children have found our solutions-based approach to living without waste to be encouraging. Often children (and adults, too), can feel the problems of the world are just too overwhelming, but by encouraging our children to become change-makers in their own right, they’ve found strength and positivity and an enthusiasm for zero waste living. Tammy - Gippsland, Australia. Mother to two, both in primary school. What I’ve learnt along the way, about parenting, is that children will do what you do, not do what you say to do. Any parenting expert will tell you that and I see it happen in my family, sometimes in positive ways and sometimes in ways I don’t want to admit too (anyone else notice their children acting like mini-mes?). Research also shows that leading by example is an important part of creating change because it establishes new social norms, that is, it helps make desired practices commonplace. So, to raise mindful and intentional consumers, I concentrate on being a mindful and intentional consumer myself. Obviously, I also guide my children by discussing my values with them as opportunities arise and this is how long term values are developed in children. It’s long term, sustainable results that I am after, so I don’t get caught up in achieving some idea of perfection for every situation we encounter. Perfection isn’t sustainable and such expectations create a lot of anxiety and often a sense of failure. Anxiety is crippling many children today so another value that I try to model and instil in my children is that we can strive for awesomeness but still be imperfect. The focus becomes more about the journey rather than the destination and we celebrate achievements. Besides this, kids go through different stages as they develop into adults and that involves testing boundaries, taking risks, understanding the consequences of their own decisions, finding their own path and working out what is meaningful to them. I give my children some space to do this. It will make them more independent, resilient, confident and wise in the long term. When it comes to influencing others, who can influence my children, I do much of the same. For example, I volunteer at kindergarten, school, and extracurricular activities so that I can have natural conversations, lead by example, and help implement changes. Again, my kids see me take action on things I believe in and sometimes have the opportunity to join in. Adjusting my mindset to be about the bigger picture of zero waste and plastic free living, rather than the everyday detail is working for us. Prior to this it was becoming clear that I was turning my family off environmentalism. Obviously, there can be more household waste than I would prefer but there is less stress and arguments and I do see my kids developing skills and making decisions that show they are becoming more and more mindful consumers. Meredith - Vermont, USA. Mother to two; toddler and baby. Hi! I’m Meredith from www.MeredithTested.com, mom of two little girls. We currently live in Vermont, USA. I’ll give away the ending right away: Being a parent presents some of my biggest zero waste challenges, but also my greatest inspiration and motivation. I considered myself eco-friendly and a mindful person before my oldest daughter was born, but she turned my earth-loving world upside-down. My motivation was locked in more intensely than it ever had before. I needed to provide a healthy, safe and non-toxic environment for her both within my home and out in the world. We used cloth diapers from the day she was born and were frankly shocked at how easy they were to use and maintain. We realized that diverting that much waste from landfills was awesome, and having a significant impact on our home environment too. We didn’t have to take out the trash as much. We weren’t required to buy a special plastic contraption to hide the smells of dirty diapers. And we never had to take an emergency trip to the store at 11pm to buy a new box of paper disposable diapers when we ran out. Similarly, I find that for a lot of things from diaper balm to crackers, once you have a simple recipe down pat and the basic ingredients on hand, making things from scratch can be easier than having to run out to the store or worry about finding the right brand. I can and do make a lot of things from scratch, but to avoid burn out I purchase certain items (hopefully in plastic-free packaging) if needed. Reducing waste while caring for babies and kids is different than when you’re a single person or couple. It’s true that we all have busier seasons and days or weeks that are more stressful than others, but kids add an additional layer of the unknown. Whether its medical needs or schooling, trash-filled situations are sometimes harder to avoid and daily control can go out the window fast. While I’ve been quite vocal on my blog and social media about how you can stick with your zero waste goals even while doing tricky things like traveling with kids, the truth is that they seem to positively attract trash. From plastic packaging on well-meaning gifts from family and friends to stickers and balloons foisted on them by strangers at the market. We appreciate the generosity and while we definitely prefer plastic-free, secondhand presents or experiential gifts (or, frankly, none at all!) we haven’t turned anything down. Except that pack of stickers from the grocery store that I was able to quickly say “no” to before my daughter noticed they were on offer. Bring wipes everywhere. A pile of cloth wipes and a little spray bottle with water or a mix of water with a touch of Castile soap is a must. Avoid disposable paper napkins and tissues (that don’t really work that well anyway), and packs upon packs of disposable wet wipes. Live by quiet example. This advice is really a reminder for myself. I love chatting but I can sometimes go overboard sharing why I love having a plastic free and low-waste home. Family, friends, and acquaintances you meet through your kid’s school, playgroups and other activities might not be familiar or understand your lifestyle. Lead by quiet example instead of giving a mini-presentation when someone asks about your stainless steel bento box. And of course do your best to answer questions or share your experiences and reasoning if asked. Go with the flow and let some things go. Having kids is taxing enough without putting extra unrealistic expectations on ourselves. I challenge myself and I try hard to stick to my zero waste goals, but at a certain point it’s okay to throw in the towel. Your mental and physical health and the health of your family comes first. Staying up until all hours of the night making DIY diaper balm or bread or … whatever when you really need sleep isn’t going to help your family in the end. If you’re a new mom who needs to give your baby formula, don’t let the packaging or any part of it make you feel guilty. Just feed your baby. If your child needs medicine but the packaging is plastic, definitely go for it anyway. If you need to buy certain foods for your family in packaging on occasion, that’s fine. 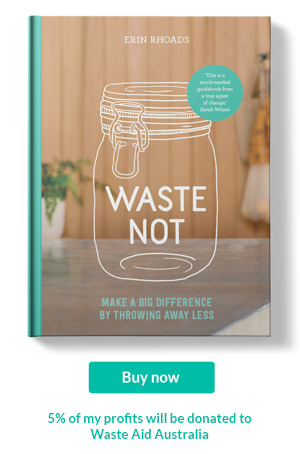 In the end “going zero waste” is about an overall commitment and mindfulness, and I truly don’t believe there are “fails.” If you’re trying to make this lifestyle work in the long term, you’ll have to compromise a little. Or sometimes, a lot. Forgive yourself, re-focus and move on.